Learn watercolor plein air painting skills combined with tours of the estuary and the landscape close to Sitka. Each morning, we paint at a specific site around Sitka followed by an opportunity to tour the estuary and around the campus. There will be a group critique at the studio in the afternoon. 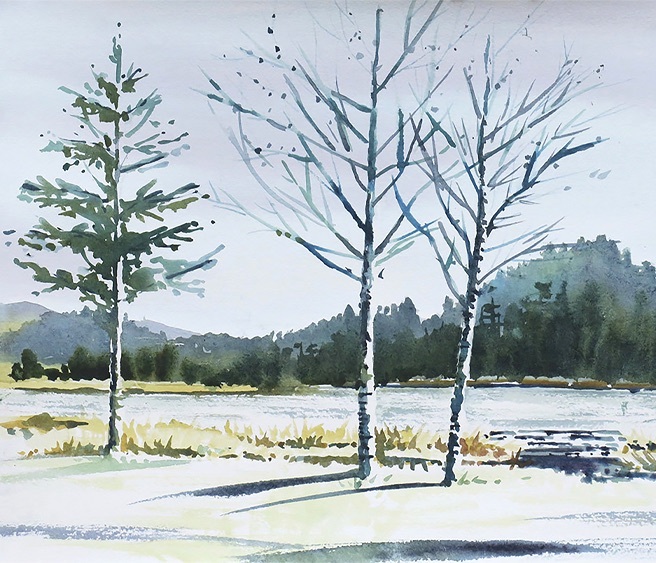 The goal of this class is to guide participants in understanding the physical, esthetic and intellectual elements of the environment around Sitka and how to capture them in watercolor. There will be easy hiking involved in each tour as well as time spent outdoors for most of the day. Satoko was born in Kyoto, Japan, and came to the United States to pursue fine art. Her medias are watercolor, sumi ink and oil. She has taught at Lane Community College for 30 years and was a part of several oversea programs offered by the University of Oregon for 18 years and taught watercolor both in Italy and Japan through these programs. She has also conducted short-time workshops in watercolor in the U.S. and Italy. Her teaching focuses on the understanding of watercolor materials, cultivating one's intuitive knowledge and self-reflection. Sarah Greene is a retired research forest ecologist, a past Sitka board member and a current Sitka volunteer. • Other Watercolor color tubes which will be necessary to use during the workshop. • Watercolor brushes #12 for everyone. • Board to secure the watercolor paper during the painting.